After a three and a half year run from the bottom in October 2002, the stock market finally decided to take a breather. A correction started in since May 2006 and is now about 10% lower. Resources and mining stocks, having led this market up, are leading it down for the moment. One troublesome observation stands out from the observed data: energy and mining stocks are underperforming their respective commodities. Since the market is a leading indicator, is it telling us something about the future of commodities? The following table summarizes the price performance of the main indices for the second quarter and the first half of 2006. The Fed funds rate (the barometer of interest rates in the US) has risen from 1% to the current 5.25%. The European Central Bank, fearful of potential inflation, has also boosted its rate. The Bank of Japan announced in March a major change in its monetary policy, abandoning the zero-rate policies that have been in place for several years and going back to charging interest on borrowing. i.e. raising rates. The People’s Bank of China followed swiftly by boosting its reserve requirements that have been unchanged since April 2004. What these developments mean is that all four central banks of the world’s major economies are in cooling mode. They are imposing policies designed to fight inflation by slowing down economic activity and reining in exuberant financial markets. The US Dollar continues to lose value versus its counterparts. It currently stands at approximately CAD 1.1236 and EUR 0.7812. Notwithstanding some minor fluctuations, we believe that the American currency will stay weak for the foreseeable future. Over the last 30 years, finance professors and other academics have developed modern portfolio theory based on the assumptions that investors are rational, dispassionate and understand the odds. Unfortunately, fifty years of financial evidence and behavioral research contradicts these assumptions. Behavioral finance is a new discipline that attempts to define the way investors actually make choices. Researchers have found that in reality, people regularly violate the basic rules of rational decision-making. We contend that investors are their own worst enemy when it comes to achieving investment success. When trying to make decisions under uncertainty, they fall back on their own worst impulses. Fear, greed, ignorance and hope rob us of our ability to make sensible, intelligent decisions about the market. We have read recently some very good books on behavioral finance and quantitative investing and we would like to share some interesting ideas with you. In order to make the topic entertaining, let us start with some tests and surveys. They have been used in different research projects to try to determine how investors make decisions. For those who can’t wait, the results are summarized later in this letter. 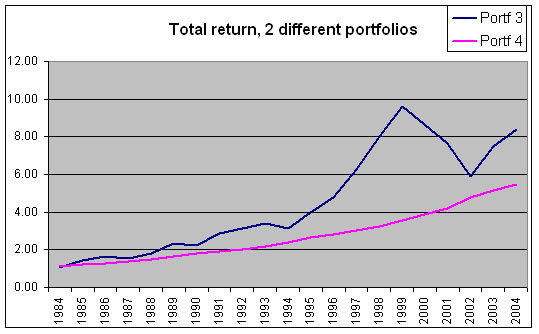 In the following graph, which portfolio is more attractive to you? Out of a sample of 100 people, 70 are lawyers and 30 are engineers. Let us select randomly 10 people. How many are lawyers? Richard is thirty years old, married, shows no interest in politics or social issues and likes to spend time on his hobbies which include carpentry and mathematical puzzles. Is he a lawyer or an engineer? How would you rank yourself on your leadership ability? How would you rank yourself on your athletic ability? An overwhelming majority of the people in the survey chose Option A in Scenario 1 but Option B in scenario 2. It should not surprise you that the odds were exactly the same in each scenario. In other words, people are risk-averse when facing gains but risk-seekers when facing losses. Generally, people find losses so painful that they will take huge risks to avoid them. This behavior cannot be considered as rational, can it? 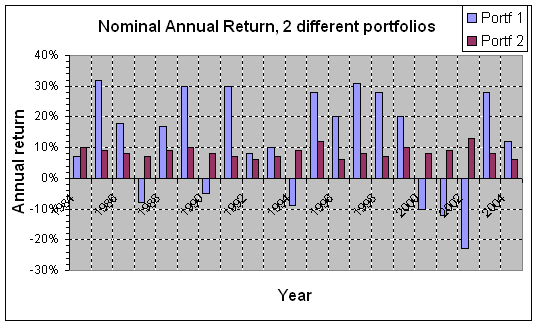 When presented with Graph 1, most people chose the less volatile portfolio Portf 2 with steady year-in, year-out gain. When presented with Graph 2, most of them picked Portf 3. They were all dismayed when they found out that Portf 1 and Portf 3 are the same and so are Portf 2 and Portf 4. This is what psychologists call “framing and shortsightedness”, a cognitive illusion most investors suffer from. When we look at the day-today or even year-to-year changes in our portfolios, the narrower time frame makes us very risk-averse. However, when the time frame broadens, we are much more likely to choose rationally. That is also the reason why people tend to invest in the currently hot sectors of the market -- when they should be doing the opposite. The obvious answer here would be 7. Most people get the answer right when there is no other information provided. This is what statisticians call the theory of “Base Rate”. In the case above, the base rate is 70%. Most prediction techniques use base rates: for example, 70% of university graduates in accounting will find jobs within 1 year; or smokers are twice as likely to get cancer. However, when worthless, descriptive and stereotypical information is added, people ignore the base rate and bet Richard is an engineer, despite the 70 percent chance that he is a lawyer. In forming subjective judgments, people look for familiar patterns, relying on well-worn stereotypes. These mental shortcuts are called “heuristics”, or mental rules of thumb. Unfortunately, when it comes to investing, these shortcuts frequently lead to errors in judgment by getting people to ignore how frequently something occurs, as shown by the results of the survey. Regarding the ability to get along with others, Every single respondent ranked themselves in the top 10 percent of the population; and a full 25 percent said they fell in the top 1 percent! Similarly, 70 percent ranked themselves at the top for leadership ability, and only 2 percent felt they were below average leaders. Finally, in the area of athletic ability -- where self-deception should be difficult --, 60 percent of males said that they were in the top 20 percent for athletic ability, and only 6 percent said they were below average. Do you think we suffer from grand delusion? Actually, we suffer from “overconfidence”. Each of us, it seems, believes that we are above average. Sadly, this cannot be statistically true. Translating this into decision-making in the market, investors are dramatically overconfident and optimistic, prone to an illusion of control where none exists. What’s in it for us (what can we learn from this research)? Nobel laureate Daniel Kahneman says: “…The biases of judgment and decision making have sometimes been called cognitive illusions. Like visual illusions, the mistakes of intuitive reasoning are not easily eliminated…. Merely learning about illusions does not eliminate them”. Such is the state of human beings – even though we know and understand why we make the investing mistakes we make, we are destined to repeat them. Neurobiologists notice in the PET scans of our brains that, when making decisions under uncertainty, the rational part of our brain is mostly dormant but the emotional part fires away! Now that we know that investors’ behavior can often be best described as bipolar – overly timid, risk-averse on the one hand and overconfident and optimistic on the other --, having a guiding, quantitative and unemotional system might be the only way to overcome the enemy from within and successfully guard against making the same mistakes over and over again. We hope you have enjoyed the surveys’ questions and results.